Many of our customers love getting out on the road in their recreational vehicles, and after this long, cold winter we bet they are itching to get started on a summer road trip. We previously highlighted a pair of our customers who spent many hours traveling in their remodeled Euro-van, who personalized and privatized their space using our curtain tracks and drapery hardware. We also have many customers with Airstream travel trailers who rely on us to keep their trailer’s curtains and tracks in working order. An essential accessory for doing just this is the T-glide. 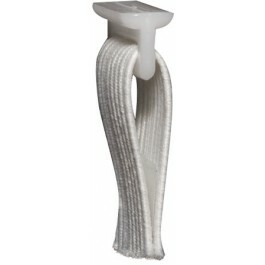 Our customers who are Airstream trailer or RV owners often call us asking for the “little T-looking things with elastic.” The T-glide, as it is otherwise known, is a white nylon glide with a 2.25 inch elastic tab that is sewn onto the curtain panel. T-glides are compatible with many of our curtain tracks, and have been used by Airstream to make their trailer and RV curtains for decades. They are also useful in boats and other types of RVs. When sewn into the top and bottom of the curtain panel, and inserted into a curtain track on the top and bottom of the window, they keep your curtains flush with the wall while allowing smooth opening and closing. This gives the curtains in the classic curved window behind the bed in the Airstream travel trailers a smooth, clean look. In a previous blog we discussed the history of the Airstream trailer, and how we can play a role in helping you keep your trailer’s drapery hardware up-to-date. Airstream has been making a similar curtain track in their trailers and RVs since the 1970s. We have compatible tracks and drapery hardware if you need replacements.